Sign up now to partner your brand with the 2018 Great Lakes Media Show, previously known as the Great Lakes Broadcasting Conference & Expo (GLBC), presented by the Michigan Association of Broadcasters (MAB). This is your premier opportunity to engage influential leaders from across the broadcast industry. 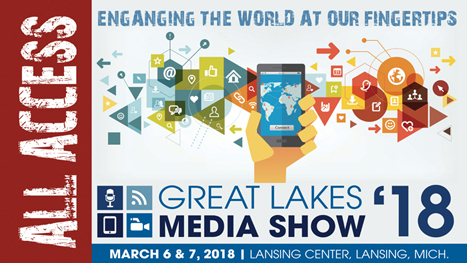 The 2018 Great Lakes Media Show will take place March 6 and 7 at the Lansing Center in downtown Lansing. Click here to learn about the many ways your business or organization can become one of our honored event sponsors. Contact Jacquelen Timm at 517-484-7444 or [email protected] to design a sponsorship package that is right for you. Previous PostWCSX’s Jim O’Brien Helping Detroit Vets Get Back To WorkNext PostWhy Should your Stations be Members of the Michigan Association of Broadcasters?